Be as active as you want - Be as quiet as your want - This time is all yours. 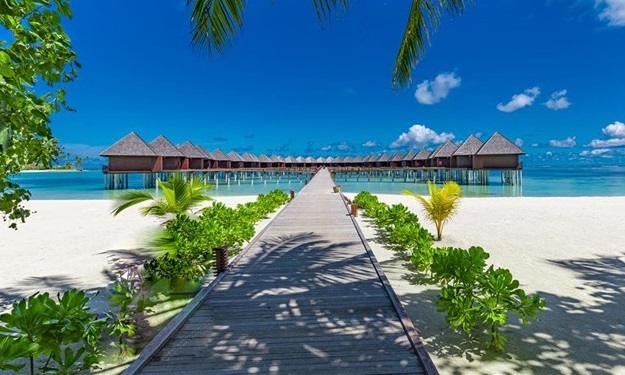 Set in the turquoise heart of the Indian Ocean that is Maldives, Olhuveli Beach & Spa Resort is situated at the tip of South Male’ Atoll and offers one of the best luxury water villa accommodations, restaurants and recreation activities. 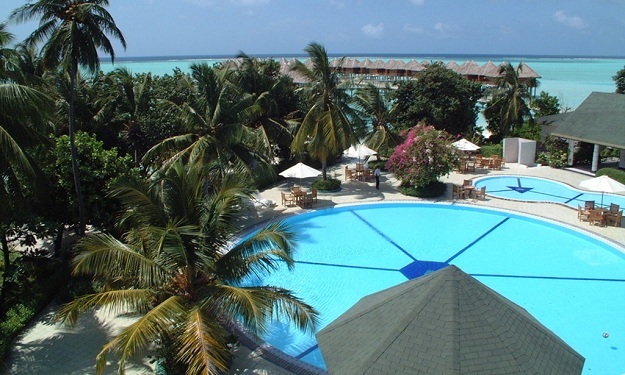 The stylish Maldivian style accommodation is beach fronted and come with a terrace or balcony overlooking the picturesque beach and the lagoon. 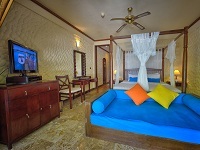 All rooms are comfortably furnished with a four poster double bed, with an en-suite bathroom and shower. 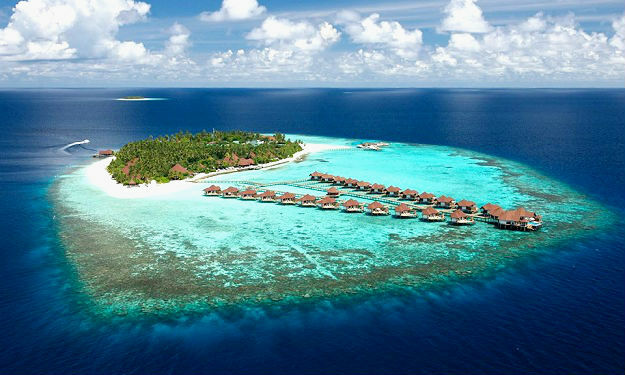 The lovely Maldivian style water villas are perched over the clear blue lagoon, with inspiring views of the Indian Ocean. 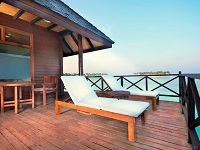 Private sundeck with sun loungers lead directly into the warm lagoon, a wonderfully refreshing swim is mere steps away. 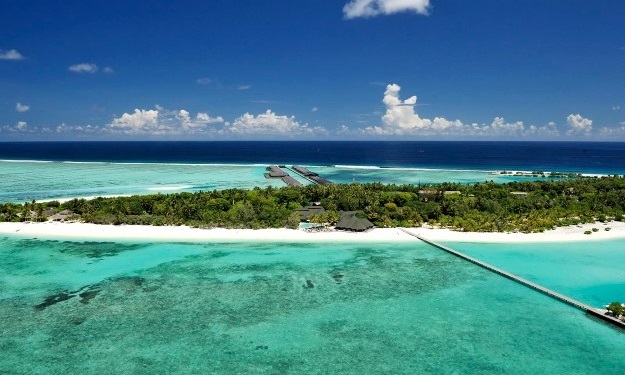 For guests who desire a hideaway among the gentle swaying trees, the individually appointed Beach villas face their own private stretch f beach and lagoon. Double doors open to a private veranda with a comfortable day lounger. The en-suite bathroom is a quiet sanctuary which opens out to its own enclosed private courtyard, completely in harmony with the natural surroundings. A roll-top bath, double vanity, open-air rain shower and sala create a sublime atmosphere in which to relax and drink in the unforgettable views. 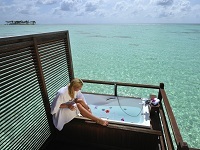 Situated on stilts over the turquoise waters of the lagoon, Sunset Jacuzzi Water Villas provide a luxury alternative. Lavish furnishing within the villa provides cool contentment while a Jacuzzi on the spacious, private sundeck lends a unique feature. The luxury bathroom feature double vanity, rain shower and free standing bathtub offer uninhibited views of the lagoon beyond. 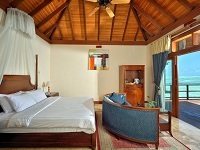 Unwind in the inviting comfort of the exclusive Honeymoon Water Villas, offering complete privacy. 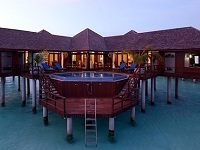 Indulge in the private Jacuzzi set on the spacious private sundeck. 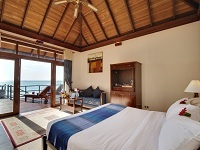 The Honeymoon Water Villas offer the luxury of a separate living room with a comfortable daybed for quiet moments indoors. Wake up from one dream into another. The Sun Spa Maldives named after the life-giving sun, an eternal light which extends through the best spa treatments to harmonise body, mind and soul. 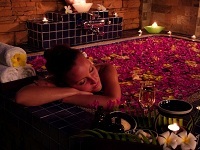 The spa has one ideal at its heart – to take a holistic approach to health and well-being using ancient Indian Ayurvedic techniques while encompassing the five elements. 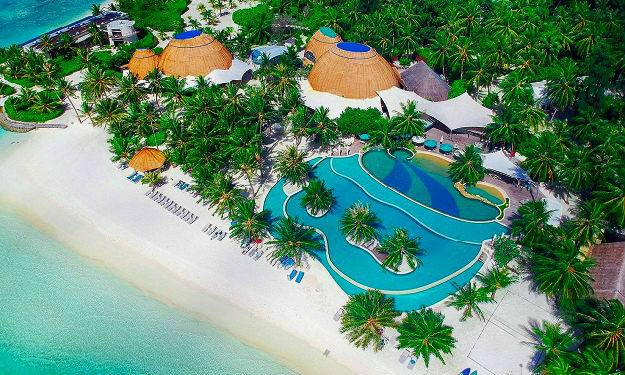 The main centre is a delightful place to relax with hydrotherapy pools, steam room, sauna, Jacuzzi, the best spa boutique with signature products, hair and beauty salon and peaceful relaxation areas on this Maldives Island. 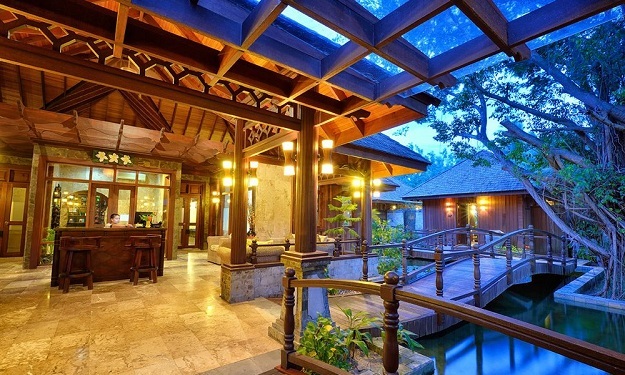 For treatments, hidden away in the vegetation and connected by a series of intricate bridges are eight secluded and private Spa Pavilions, featuring a courtyard garden, twin massage beds, a rain shower and an outdoor flower bath. 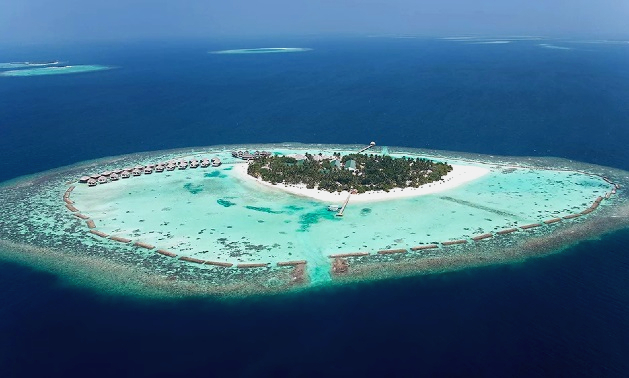 Submerge into a whole new world of wonder and find out why this is the dream destination of every diver, with its inviting warm water, astonishing clarity and hidden bounties. As you descend, you are greeted by breathtaking species and a profusion of soft and hard corals in a kaleidoscope of colours and shapes. Swim along to discover the shy giant moray eel, the elegant lion fish, the camouflaged stone fish and the clever octopus among other amazing species in the prolific house reef. The lucky ones may encounter a Green Sea Turtle, adult Reef Shark, hump-head Napoleon Wrasse or get up close with the majestic manta ray. Uncover the mysteries of the hidden caves, overhangs and sunken ship on your quest. 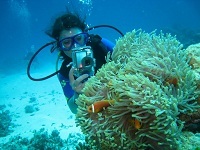 A holiday is certainly never complete without witnessing the spectacular underwater wonders of the Maldives. 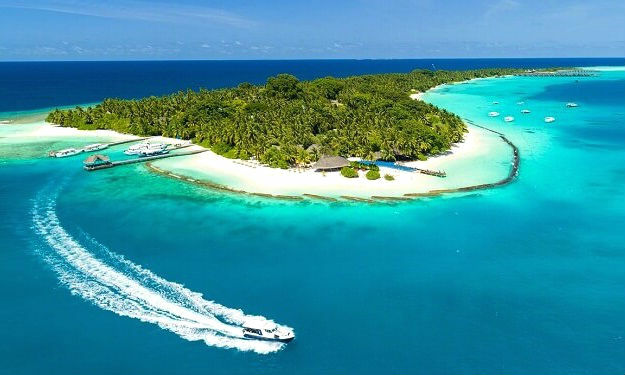 Water Sports World in Maldives is on hand to give you guidance and lessons with a multi-lingual and enthusiastic team who will comfortably take you through a course of windsurf, paddle a kayak, sail a catamaran or water ski to your heart’s content. All our equipment are the latest and modern models that assures quality and safety. 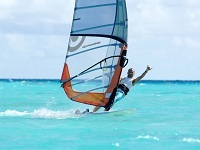 Olhuveli Beach & Spa Resort houses the first certified kite surfing school in Maldives with impressive equipment, courses and lessons. 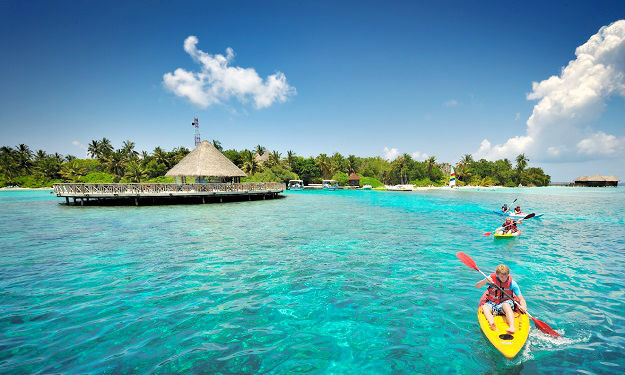 Get your adrenaline pumping with a ride on the banana boat or take a leisurely stroll around the island in a canoe. For the speed freaks, the newly introduced jet skiing in the outer lagoon will be a real treat. 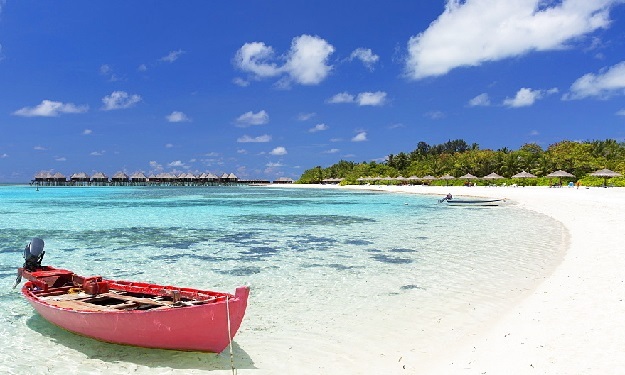 If you feel the need to be more active and explore the surroundings, the Maldivian Local Island tour gives a glimpse at early seafarers and the traditional and simple lifestyle embraced by the locals. 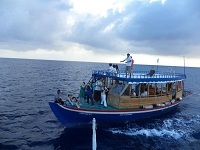 You can also hire your own boat and be driven among the smaller islands around the Atoll or go on a snorkeling safari. For the fishing enthusiast there is big game and sunset fishing, when you might catch a prized Mahi Mahi, Yellow fin tuna or sailfish. 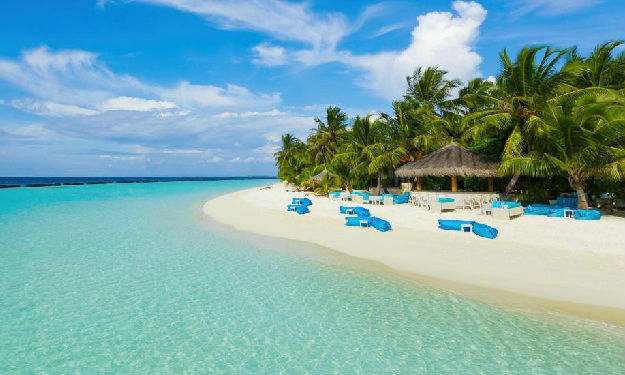 A trip to Male’, the smallest capital in the world is not to be missed with its buzzing fish markets, mosques and motorbikes galore! Combine the tour with a dive in the world’s largest passenger submarine. The large fresh water swimming pools with infinity edge, Children’s’ pool, Flood-lit tennis, volleyball, fitness center, badminton, gymnasium with instructors, table tennis, billiards, board games, Private Karaoke Room with an extensive selection of international songs. Whether you have just begun the amazing journey together or your timeless love for each other has held you as one against the test of time, The resort offers you the perfect setting, mood and place to say ‘I do’ all over again. A poignant ceremony created to inspire romance, a beachfront location, soothing sound of waves lapping, cool ocean breeze and the traditional Maldivian touches. Embark on a romantic sail in the arms of your partner while the glorious sunset casts a magical spell on you… for love, romance and passion to last a lifetime. A gastronomical journey follows under moonlit sky and flickering candles. 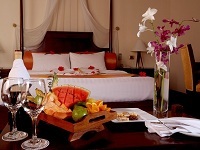 Back at the villa, a honeymoon turndown service transforms. The perfect beginning to a happily ever after! Get spoilt by the sheer choice of gastronomic experiences created with just you in mind. Find the perfect spot from the stretch of private beach under the stars, at the poolside or in the privacy of your villa. 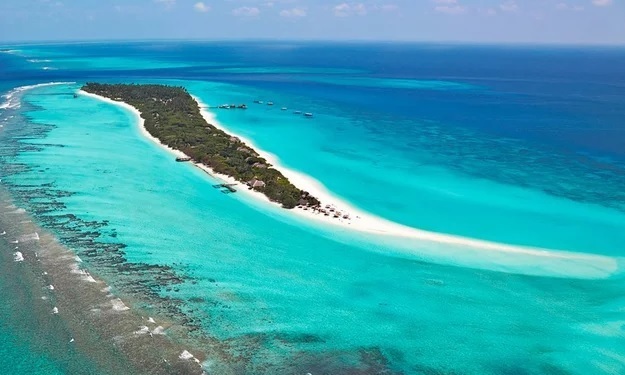 A light lunch of Maldivian catch on your terrace, Champagne and canapés while watching a sunset from your perfectly positioned water villa, private BBQ of fine cuts on your private sandbank. All served with discretion to give you privacy. The Plankton Grill is an outdoor seafood restaurant with an open-style kitchen. Guests are offerd a selection from an array of seafood available at the counter ranging from fresh Red Snapper, Grouper, Crabs and Lobster. The delectable dishes with an extensive use of marinades, cures and rubs ensures highly seasoned dishes that evokes ones taste buds. Amidst a romantic ambience by the shores of Olhuveli giving you a refreshing yet memorable experience while you indulge in the famous seafood platters. This lively venue has an enviable buzz about it and is ideal for daytime or early evening drinks. Naturally colourful thanks to the lush tropical vegetation growing in abundance outside, the bar are positioned close to the main pool of the island. As well as being the hub of activities to take part in, the varied menu is accompanied by a wide range of drinks on offer. 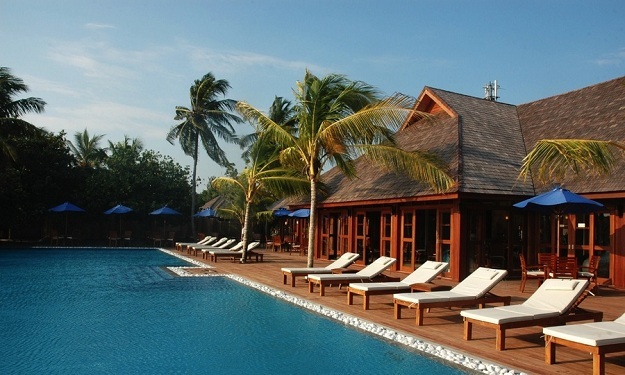 Order a mojito, sit back and enjoy in many lounge chairs around the pool. There’s nothing better than watching the sunset with a loved one or family, as friends old and new unwind. Lagoon Bar, the venue for Maldives evening entertainment sits right at the water’s edge with a wonderful deck area and great atmosphere. 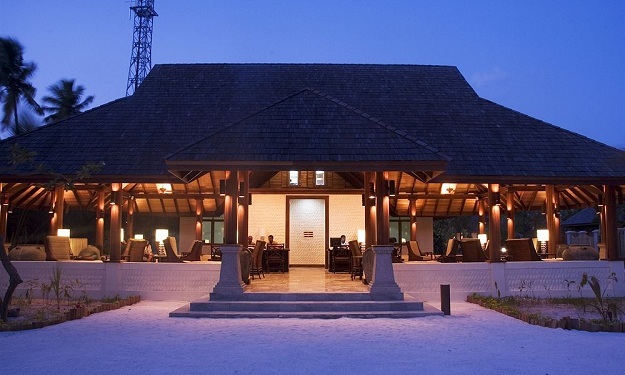 It’s the perfect place for cocktails and conversation while enjoying a Maldivian folktale. A wide range of beverages are available until the early hours. Situated next to the sunrise pool, the Island Pizza offers a selection of delectable pizzas made out of fresh and seasonal blend of ingredients and includes local seafood, Asian, Mediterranean and Western flavours to your taste. The menu also includes an array of deli-style sandwiches and burgers that are perfect for a light lunch or snack in between meals. Open every evening for dinner, the over-water setting of The Four Spices is perfect for fine à la carte dining and ideal to celebrate a special occasion. 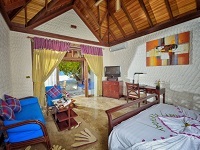 Olhuveli Beach & Spa Resort team is on hand to guide you through the bespoke menu and match wines with dishes. This is Asian food at its finest with highlights on Japanese, Indian, Thai and Maldivian flavours. Indoor or outdoor seating is available. 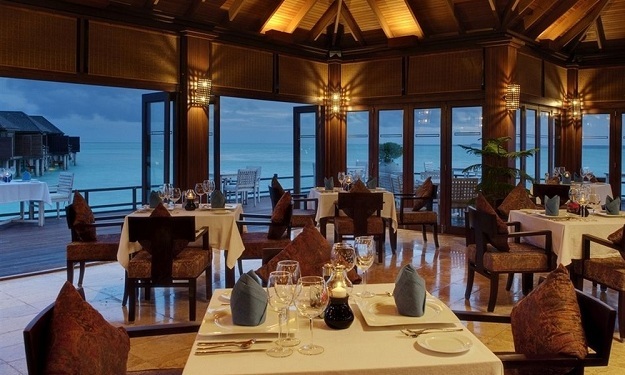 For guests who find getting away from the Maldives beach impossible, the Lagoon restaurant sits right on the beach with ample open decking and overlooking the beautiful lagoon. As well as being the main setting for lunch, it makes an informal but enjoyable place to have sumptuous supper and talk long into the night. 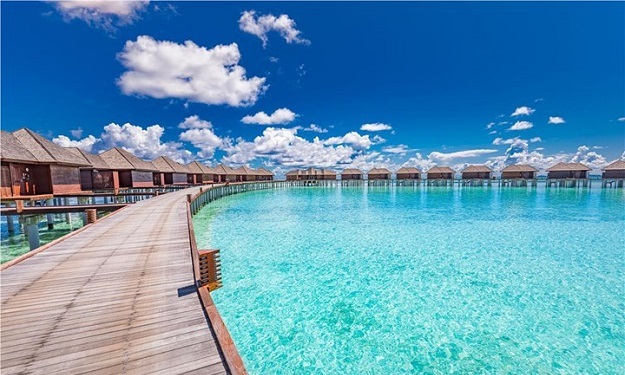 One of the largest over water restaurant in the Maldives, the main restaurant is open daily for breakfast and dinner with an emphasis on local or international flavours. From succulent prawns in spices to outstanding wines, the open-sided design means a meal here is pleasantly cooled by gentle sea breezes. As well as buffet-style dining, one of the highlights is the live cooking stations, when tantalizing flames and scents arise under the careful eye of talented chefs. Great cooking deserves a splash of theatre. The extensive open deck gives the choice to sit under the stars for an alfresco dinner.